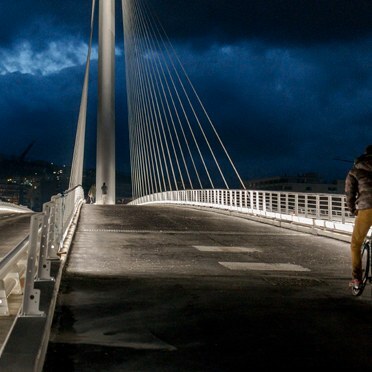 In January 2018 a stunning new road and pedestrian bridge opened in the southern Italian city of Cosenza. 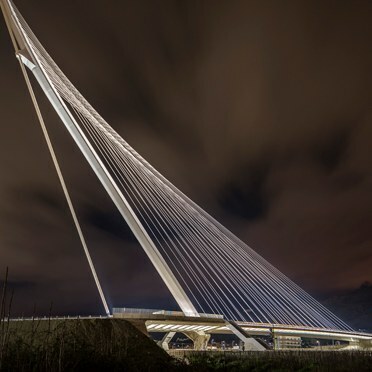 Designed by renowned Spanish architect Santiago Calatrava, the San Francesco di Paola bridge is one of the most significant infrastructure projects in the region in recent years. Calatrava’s vision was to create a “harp-shaped” bridge. Suspended from a 104-metre-high “antenna”, rising at an angle of 52 degrees, the cables that support the bridge are reminiscent of the strings of a harp. 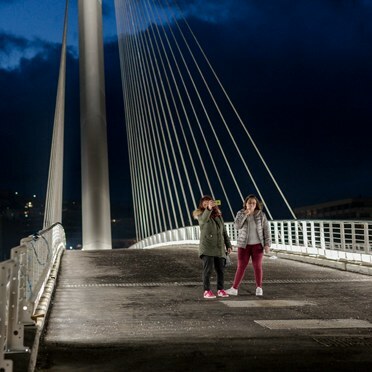 The bridge’s lighting had two objectives: to enhance the view of the great “antenna” from a distance, and from a functional point of view, to provide clear and comfortable illumination for vehicles and pedestrians. The lighting system consists of forty large 88W Contrast LED spotlights from Thorn, mounted on the bridge’s 40 tie rods. Each spotlight has a narrow 8° beam angle and a colour temperature of 4000K, chosen to complement the structure’s white body. Equipped with refractors and anti-glare visors, the Contrast LED spots provide a uniform glow along the antenna, ensuring maximum visual comfort for pedestrians on the bridge’s walkway, which runs in the middle, between the lanes of traffic. All the spotlights are RGB and can be controlled using a DMX controller, to create dynamic light shows for special events. They can even be synchronised with music to make the whole bridge mimic a giant harp. 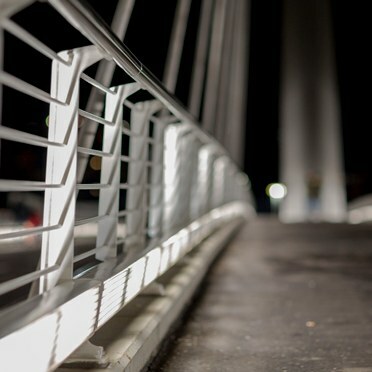 The design also includes side lighting along both the traffic and pedestrian lanes, with Tubilux LED fittings from Zumtobel installed into the lower part of the railings to create a “carpet of light”. The cables for the Tubilux fittings are simple and extremely slim, with a mechanical anchoring system for easy insertion into the structure of the bridge, saving time and money during installation. 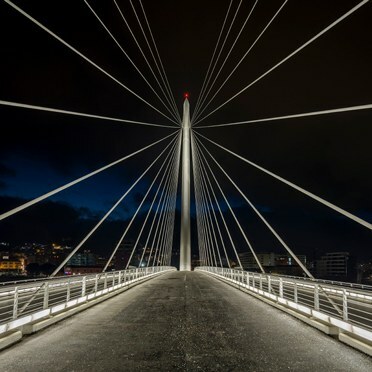 The new bridge shows how light can transform structures into true landmarks. The bridge’s majestic antenna is now an iconic feature for the city of Cosenza. By using LED lighting, the bridge uses 60% less energy that it would have if an alternative metal halide and fluorescent design had been used, with an installed load of just 37kW.